Worship should be less about pressing the play button on your iPhone and more about learning how to sing a new song. Listening to worship music on replay feels like eating a McRib from McDonalds for every meal. 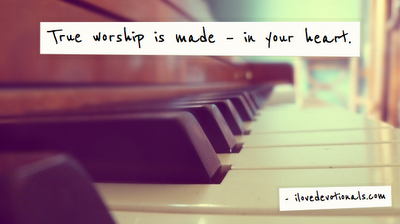 It’s almost impossible to grasp the fullness of worship by listening to somebody else’s song. David in the Psalms exclaimed over and over to sing a new song–six times to be exact. For when life was grand. What if instead of microwaving a song or let someone else feed us in under three minutes–we pressed the pause button and actually thought about what we’re thankful for? For family and friends and laughter. Although I can play the piano and I used to play in a church worship band–it’s been years. A couple things had to happen before I cooked up this thought on music and fast food. 1) I recently lost 14 pounds. 2) I dusted off my old keyboard and played a little and had to think about which fingers were hitting which keys. Not to mention which songs I wanted to sing and why. Worship is giving God worth. 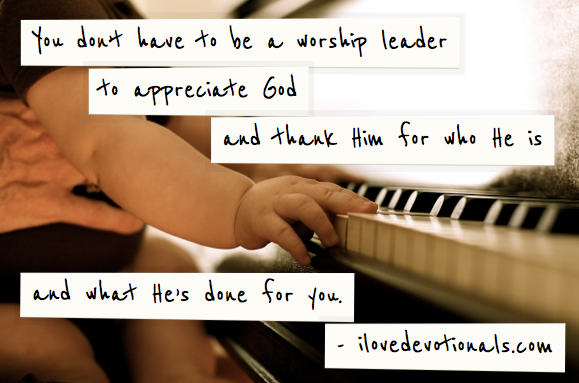 “To worship God, is to approach him. And if the heart be full of his love and fear, out of the abundance of it the mouth will speak; but there are many whose religion is lip-labour only. When they pretend to be speaking to God, they are thinking of a thousand foolish things” (Matthew Henry’s Commentary on Isaiah 29–see below). “These people come near to me with their mouth and honor me with their lips,but their hearts are far from me. Their worship of me is made up only of rules taught by men” (Isaiah 29:13, NIV84). Before SonicFlood made it cool to record a worship CD–you usually had to go to church to listen to praise music. Most CCM artists Carmen, Michael W. Smith, or Point of Grace weren’t singing hymns yet. Skip a generation–and now worship has become all about Hillsong and Jesus Culture. Sometimes I wonder if we are treating Jesus like a hipster. Now don’t get me wrong–I have nothing against skinny jeans or worship music. Learning the words and singing out loud with your friends at youth group has been replaced with–see how many songs you can listen to in your car on the way to work. Have we lost the ability as a Christian culture to worship God together? Alone? In the days of social media and fast food, it’s no wonder we’re more unhappy and alone. More than ever we find reasons or excuses–some are valid–to skip out on worship. Maybe it’s because we’re busy. Maybe it’s because if we’re honest–we haven’t found a church we like yet or maybe their worship doesn’t sound like the CD either. God deserves our praises. To Him be the glory. Are we so set on allowing someone else to feed us that we no longer take the time to drum up a heart of worship for Jesus and get fed in His fullness alone? In this holiday season–with Thanksgiving today and Christmas and New Year’s around the corner–it’s time to press pause. Instead of popping in our ear buds, I hope we’ll learn to take a moment and tell God in our own words why He’s worthy of our worship. Instead of getting high on the phat beats you’ll learn to appreciate how true worship is made–in your heart. How do you worship God (i.e. how do you sing a new song and what does it look like)? If you enjoyed this you can subscribe to I LOVE DEVOTIONALS here or follow on Twitter and Facebook. 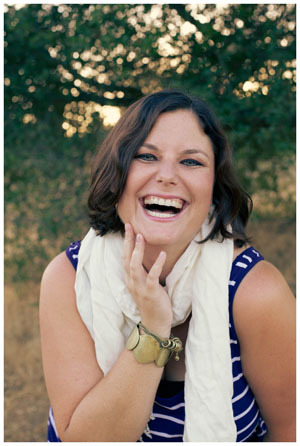 Renee Fisher is the Devotional Diva® and spirited speaker to the 20-somethings. She is the author of Faithbook of Jesus & Not Another Dating Book. She loves her engineering husband and their pit bull they rescued named Star. She writes at devotionaldiva.com and you can find her on Twitter. How Do I Know If God Is In Control?